- Rigidity gives dimensional accuracy to the material to be ground. - Positive retention ensures grinding efficiency and long, useful wheel life. - Low grinding heat generation promotes fast and precision grinding ability. 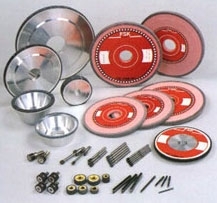 - Low rate of wheel wear results in low grinding costs.